Officers of the 7th Battalion at Marbury Hall, Northwich, with one of the battalion's armoured carriers, June 1942. 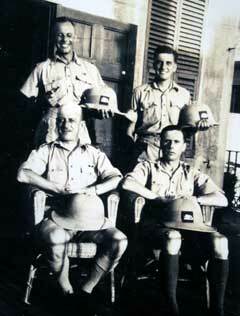 Left to right is Lieutenant G Riches, unknown, Lieutenants Welbourn, Boughey and Coakley. Officers of 'A' Company, 7th Battalion, on the roof of the house where they were billeted while in Gibraltar, just off Main Street. 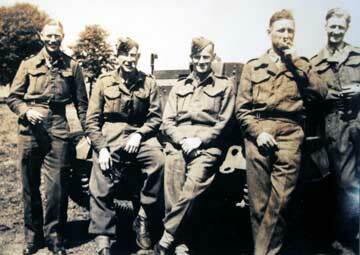 Rear left to right, Lieutenants Barnes and Graham Thomas, and seated Major A Burton and Lieutenant Cowan. Lieutenant J W Devonshire took the photo, August/September 1942. 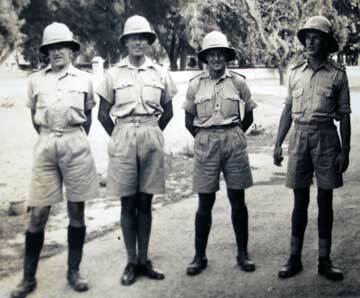 Officers of the 7th Battalion outside the Mess in Lahore, April 1943. Left to right Lieutenants R A G MacIntosh, Barnes, Graham Thomas and Islay Martin. 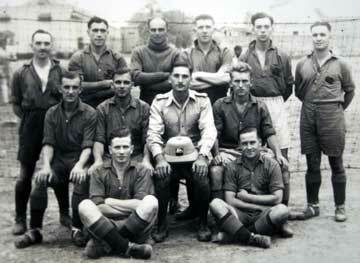 Company soccer team, 7th Battalion, Lahore, 1943. 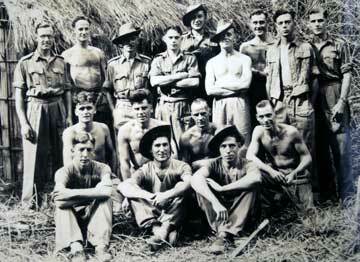 Back row, left to right, Lance Sergeant W Irwin, Privates Seddon, Fleet, Graham, Sergeant Mulholland, Company Sergeant Major J Farghar. Seated, Corporal G Robinson, Corporal J Ashworth (played professional football for Halifax), Lieutenant Jenkins (played professional football for Blackpool) and Private A Hudson (played for Fulham). Front row, Lieutenant H Rawcliffe (played for Blackburn) and Colour Sergeant Stan Eastham (played for Blackpool and Burnley). 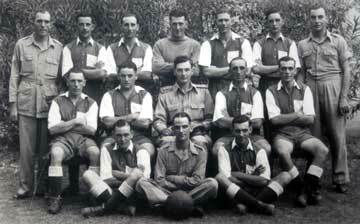 'A' Company soccer team, 7th Battalion, Lahore, 1943. Photo of some of my Company in front of a 'basha' we built in the jungle in southern India, 1945. Back row, Major J W Devonshire, Colour Sergeant G Hone, Private H Lockwood (Major Devonshire's batman). Standing row, left to right, Lieutenant F Thompson, Captain S Islay Martin, Lieutenant B A Green, Private C Mason, Company Sergeant Major Meechan and Sergeant W Mulholland. Kneeling row, Privates G Russell, A Osbaldeston, W Cash, and Corporal Whitham. Front row, Privates E Preston, Robinson and C Noble.